Two footed winger who joined City during the 1938/39 season. 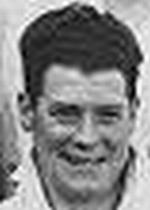 His spell at City straddled the war, and he made 55 appearances scoring 7 goals, the last during the 1945/46 season. Johnny passed away in 1990.